With the passing of Labor Day weekend the summer comes to an end. The sticky heat of the summer is pushed away with the brisk cool autumn breeze. We are adjusting to the school year routine. Soon the leaves will fall from the trees, and all my neighbors will spend their weekends clearing their yards of the leaves. I prefer to let nature take its course, and let the winter winds push the leaves around the yard until they settle either into the woods behind the house, a corner of the garage, or into my neighbor’s yard, where they will be collected and put in their proper place. I like to think of it as being efficient. Some may call it lazy. But regardless of my future laziness, this weekend was anything but. Saturday we all made our final journey up to Six Flags amusement park. We even brought Will’s best friend, Tyler, with us (because it isn’t nearly exciting enough to keep track of just two boys running around a crowded park). The previous two trips made very long days – getting home well after the boys wanted to go to sleep. We learned this time. Once the boys started fighting on what ride to go to next – well fighting more than normal boys that age fight – we packed up and headed out to dinner. Instead of a 7:30pm departure (as in the past), we were at dinner by 5:30, and home by 7:30. Everyone was still exhausted, but it didn’t carry into the next day. We decided on Sunday to not rest. The weather was pleasant. 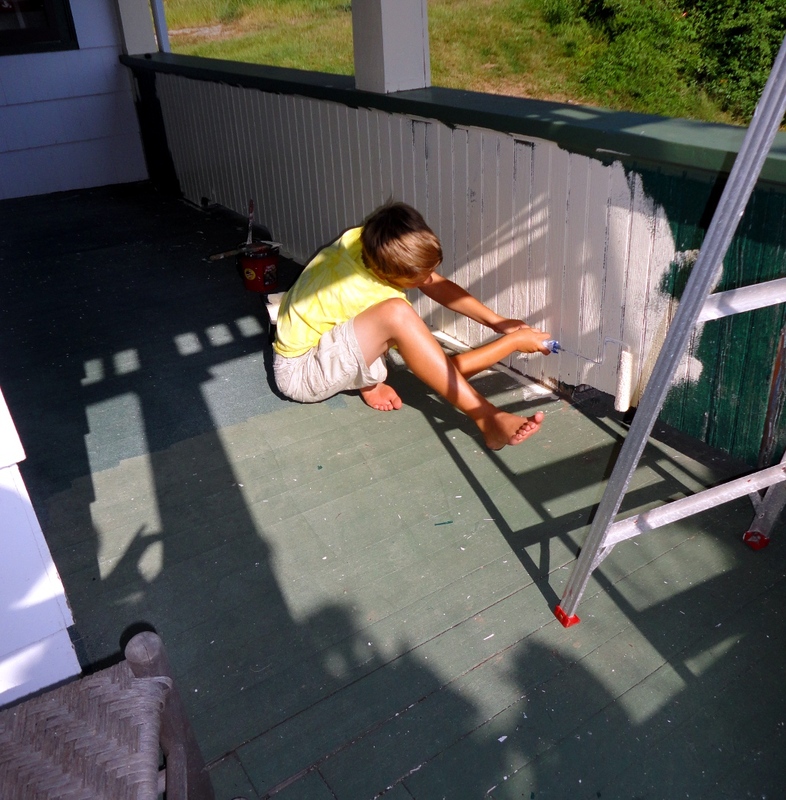 It seemed a perfect day to work on painting the porch. 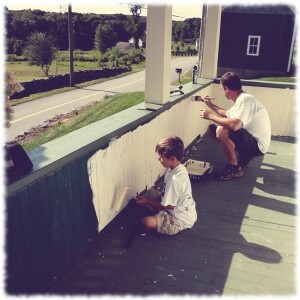 It would have been a perfect day to finish painting the porch, but there was too much left to easily finish, and we didn’t want to work that hard. The boys worked on painting their part of the project, with a little help from Susanna and me. They decided the paint rollers were much better than using the brushes. I decided that it was okay that we would have to use two coats on the porch floor to cover up all the white paint they dripped on it. Don’t worry, I’m not perfect. I only decided it was okay to use two coats on the porch floor after getting very frustrated with Will and Ben several times about how much paint they put on the rollers each time. I started painting the trim around Will’s window (Susanna argued that it would look better to have all three windows on that side of the house with trim painted vice just having the two bottom ones). On Sunday I painted the right half of the trim, then supervised the boys as they tried to see how brave they were climbing up the ladder. Neither made it half way up. Today I was going to finish painting the left half of the window trim (and no – I didn’t need Susanna to point out that having the entire window painted looked better than just half of a window – I figured that one out on my own). Of course, when I got up there, the scroll-work around the trim was falling apart and needed some epoxy repair. So, no painting the left half of the window today – and we will have to live with a goofy looking window until the weather allows us to paint again. Today’s plans (in addition to the failed plans to finish painting the trim) were to get the boat out of the garage. The first step was to get the boat back on the trailer. It took nearly a whole day of work to get the trailer out from under the boat. I figured that now that I had experience getting the boat off the trailer, getting it back on would be simple. It wasn’t. But it wasn’t as bad as getting the trailer out. The most difficult part of getting the trailer out was moving the trailer with a flat tire. But I had fixed the trailer, and a trailer with two inflated tires is much easier move than one with only one inflated tire. With a lot of work we got the trailer back under the boat, and slowly lowered the boat onto the trailer. And the tire that I had repaired promptly went flat with the weight of the trailer on it. Needless to say, the boat is still in the garage. After lunch the boys and I went out and got a new wheel for the trailer. This week, my goal is to replace the flat tire on the trailer with the new wheel. My goal is to get the trailer out of the garage sometime this month.